A Ben Halloran brace has delivered Adelaide United a 2-1 victory against an injury-hit Brisbane Roar and second spot on the A-League ladder. Brisbane's loss at Adelaide's Coopers Stadium in a feisty Friday night fixture was compounded by injuries to in-form striker Adam Taggart, Frenchman Eric Bautheac and Stefan Mauk. Taggart, who had scored five goals in five games entering the fixture, limped from the field with a groin injury after 35 minutes. Bautheac hobbled off in the 55th minute after copping a knock to his right knee in a collision with Reds defender Taylor Regan, who was later sent off for a face-grapple on Mauk in a separate incident. 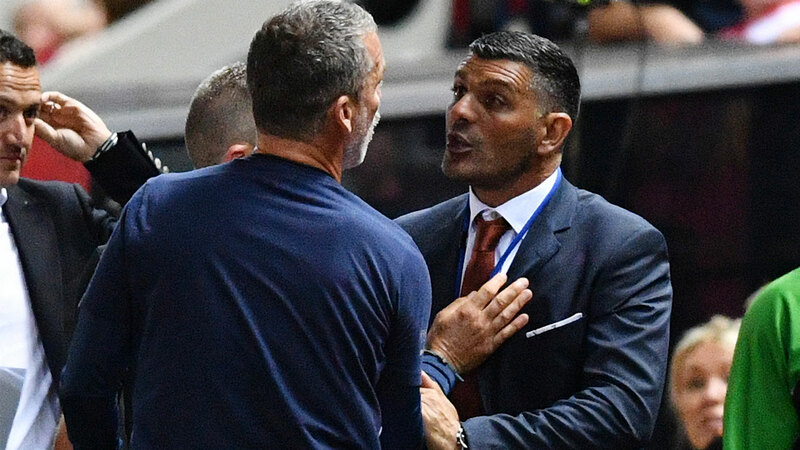 And Mauk was knocked out - and given a straight red-card - for a studs-up crash with Adelaide's Craig Goodwin in injury-time which sparked a heated sideline argument between coaches Marco Kurz and John Aloisi. Halloran slotted the initial two goals of the game before Brisbane's Henrique revived the visitors with a poacher's goal. Halloran banked his first A-League goals since 2013 when, ironically, he scored for Brisbane in a win against Adelaide. Halloran, who has spent the past five seasons in Germany and Japan, scored his first with a crisp first-time left footed clip in the 43rd minute. And four minutes after haltime, the 26-year-old added another when he tapped-in after teammate Ryan Kitto sped towards the byline and launched a speculative cut-back pass. A diving Roar gloveman Young attacked the ball but parried into the path of Halloran, who converted from two metres. But Adelaide had to endure a nervy final 25 minutes after Henrique, who replaced Taggart, replied for Brisbane in the 67th minute. Henrique slid past Adelaide's defence to latch onto a low cross from fellow sub Dylan Wenzel Halls to score from close-range. 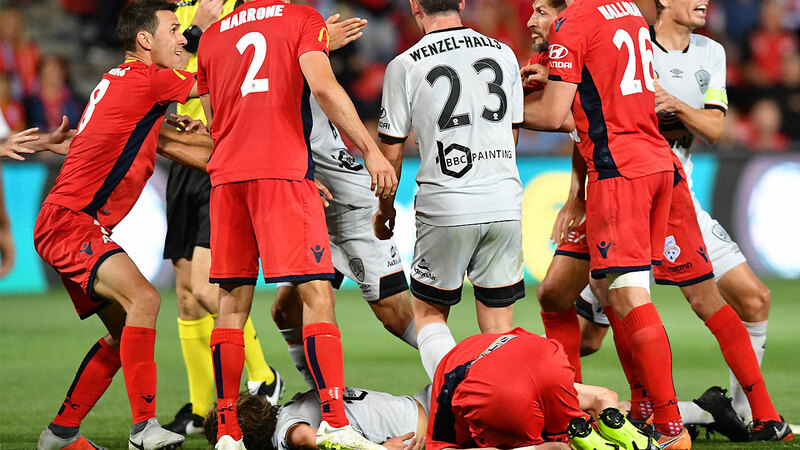 Adelaide played the final 20 minutes with 10-men after Regan was sent off after an unseemly melee involving a mass of players. 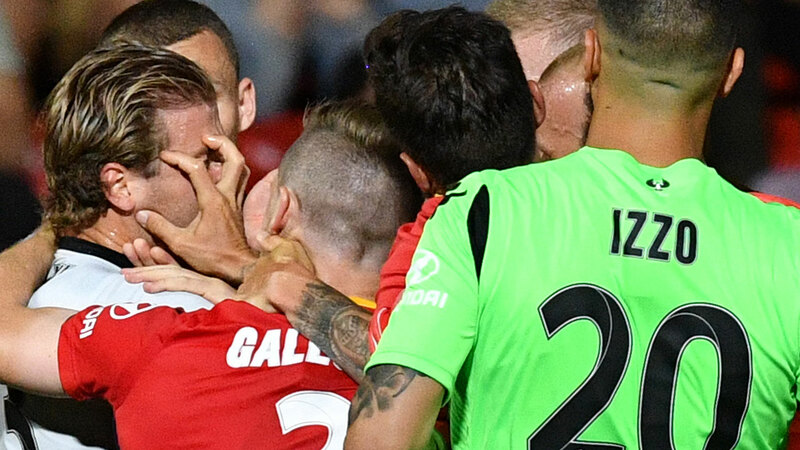 Regan, who had earlier been yellow-carded, placed his fingers in the face of Brisbane's Mauk and copped another yellow after the scrap was reviewed by the video assistant referee. Mauk was then marched in injury-time when red-carded after a collision with Goodwin left the Roar recruit prone on the turf as another melee ensued. Following the game, fans were left seething at Regan's actions as well as the Mauk's sending off, but also praised Isaias for protecting his opponent.